<b>** TO VIEW THE MEANINGS AND USES OF THE DROPS, VISIT OUR BLOG - </b> <a href="https://drreckeweg.wordpress.com/2014/10/16/dr-reckeweg-homeopathic-drops-uses-and-benefits"><b>CLICK HERE.</b></a><br> <br> <b>USES:</b><br> <b>Dr. Reckeweg Cineraria Eyedrops</b>, useful in strained eyes due to reading, TV viewing , computer usage and air pollution. The medicine can also be used by children. Cineraria Eyedrops is alcohol and irritation free.<br> <br> <b>Ingredients:</b><br> Senecio bicolor subsp Cineraria (Cineraria maritima), benzalkonium chloride, sodium chloride, sodium bicarbonate<br> <br> <b>Dosage:</b> <br> <b>Adults:</b> Unless otherwise prescribed, two drops three times daily into the affected eye or as directed by a health care practitioner. After closing the lid, massage it nasally across the conjunctiva to distribute the solution evenly. Lenticular opacity requires several months of treatment.<br> <br> <b>Note:</b> Can be used when wearing <b>hard</b> contact lenses. When using <b>soft</b> lenses a minimum period of two hours between administration of drops and putting the lenses in eye must be adhered to. No irritation due to absence of alcohol, can be used at all ages. No residual wastage, can be used up to last drop. Pilfer proof, no immitation or refilling possible. 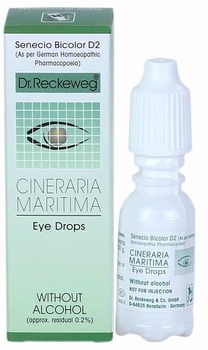 Dr. Reckeweg Cineraria Eyedrops, useful in strained eyes due to reading, TV viewing , computer usage and air pollution. The medicine can also be used by children. Cineraria Eyedrops is alcohol and irritation free. Adults: Unless otherwise prescribed, two drops three times daily into the affected eye or as directed by a health care practitioner. After closing the lid, massage it nasally across the conjunctiva to distribute the solution evenly. Lenticular opacity requires several months of treatment. Note: Can be used when wearing hard contact lenses. When using soft lenses a minimum period of two hours between administration of drops and putting the lenses in eye must be adhered to.